Damage that occurs when bacteria in the mouth produce acids that erode the teeth is called tooth decay. Tooth decay can lead to holes in the teeth known as cavities. If tooth decay goes untreted, it can lead to toothache, infection and even loss of teeth. Let’s talk a little bit about teeth. 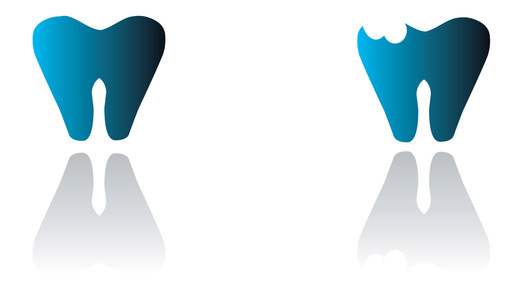 A tooth has three layers. A hard outer layer called the enamel, a middle layer known as dentin and the center of the tooth, called the pulp. Inside the pulp of the tooth is found nerves and blood vessels. The farther into the tooth decay goes, the more serious the damage is to the tooth. Why does tooth decay occur? Plaque, a sticky substance that forms on the teeth, is made up of bacteria that are fed by sugars in the food you eat. As the bacteria feed on these sugars, they produce acids that attack teeth for as long as twenty minutes or more after eating. If these acids are allowed to remain on the teeth, they damage the enamel and cause decay. Smoking, breathing secondhand smoke or using smokeless tobacco. Children are more prone to tooth decay because their teeth are still growing and the enamel isn’t as hard, making their teeth weaker and more vulnerable to erosion from acids. Even babies too young to eat solid food can have tooth decay. Babies who fall asleep with a bottle containing anything other than water can suffer from “bottle mouth”, which is tooth decay caused by sugars found in milk, juice or formula. Babies are not born with the bacteria in their mouths that cause decay, but they can pick up the bacteria from sharing spoons or forks with adults. If you develop a toothache, see a dentist as soon as possible. Even if the pain subsides, the tooth will continue to decay. If you delay treatment, the cavity will get worse, the pain will return, and the tooth may die. A dentist can remove the decayed area and fill the tooth, preventing further problems.